Description of artwork It would not be Christmas with out the Holiday candy and for that is mints. 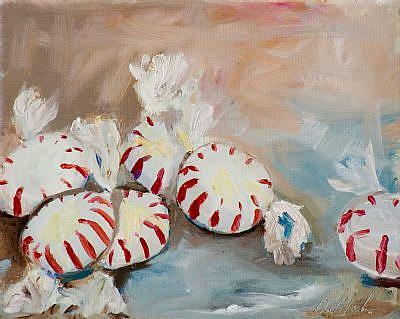 TITLE: Christmas Mints This work has been clear coated to protect your investment Style: impressionism Size: 8x10 Colors: red,blue,gray Depth: 3/4 Medium: oil Support: stretched canvas Shipping: USPS Priority Ready to Hang: the sides are painted and the backis wired or it may be framed if you like. Signature: Always Signed Paintings are shipped worldwide, personally packaged, and fully insured. .